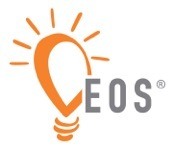 The EOS Model™ is the first element in the EOS Business Management System, providing a visual illustration of the Six Key Components of any business that must be managed or strengthened to be a great business. This model applies to big and small businesses alike, in any industry. The 1st Key Component is called the Vision Component™. Strengthening this component means getting everyone in the organization 100 percent on the same page with where you’re going and how you’re going to get there. The 2nd Key Component is the People Component™. Simply put, we can’t do it without great people. In this business management model, this means surrounding yourself with great people, top to bottom, because you can’t achieve a great vision without great people. With the Vision Component strong, the People Component strong and the Data Component strong, you start to create a transparent, open and honest organization where everything becomes more visible and you start to “smoke out all the issues”, which leads to the 4th Key Component. The 4th Key Component is the Issues Component™. Strengthening this component in the business management model means becoming great at solving problems throughout the organization – setting them up, knocking them down and making them go away forever. The 6th and final Key Component is the Traction Component™. This means bringing your Vision down to the ground and increasing the level of discipline and accountability in the organization – becoming great at execution. 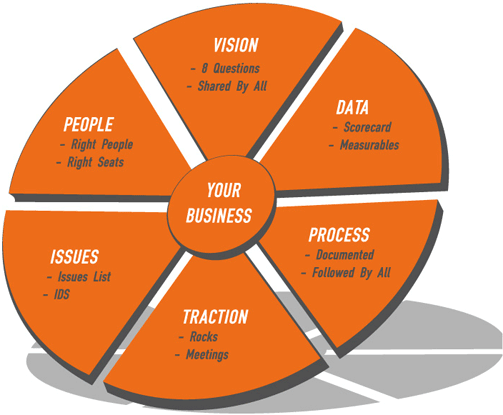 Those are the Six Key Components in a simple, comprehensive business management model. To the degree you focus on strengthening those six as leaders and managers, everything will fall into place.